MICRO Miller FF-500/ CNC (comanda numerica) -- Made in Europe !! Machining of steel and non-ferrous metals is possible in all dimensions thanks to CNC control of 3 tool axes. Axes X, Y and Z with recirculating ball spindles (no backlash) and powerful step motors. Apart from this, the mechanical construction is almost identical with the MICRO Miller FF 500: solid, flat-milled compound table in steel with 3 continuous T-slots for size 8 standard T-nuts. Feet in vibration-damping cast steel. Stable column with dovetail slideway. Swivel-mounted milling head with powerful, quiet and shock-free running condenser motor. Poly V-belt drive for 6 spindle speeds. Additional sleeve feed (30 mm) using drilling lever with scale ring (1 graduation line = 1 mm). This can be clamped using a tommy screw when CNC milling. Workpiece fixing using chuck. Complete with CNC control unit, CNC programme software, all connecting cables, 6 - 8 - 10 and 12 mm chucks and detailed manual. 220 - 240 V. 400 W. 50/60 Hz. Spindle speeds 180 - 350 - 550 - 800 - 1300 and 2500 rpm. Column height 430 mm. Table 400 x 125 mm. Cross traverse (x) 290 mm, depth (y) 100 mm, height (z) 200 mm. Work table 370 x 350 mm. Total height approx. 780 mm. Weight approx. 50 kg. The CNC control unit is the interface between the PC with CAD/CAM software and the CNC miller. Data transfer from the PC takes place using an RS232 interface. 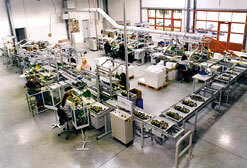 Microprocessors control the stepped motors on the 3 axial drives and the milling spindle drive. Two freely usable output relays provide additional facilities (e.g. control of cooling device or signal display). Including connection cables with suitable plugs and built-in power supply for connection to 220 - 240 V.
The CAD window is displayed when the programme starts. The workpiece contour is created in the familiar Windows® environment. Numerous auxiliary aids help during programme operation, which supports both coordinate entry (absolute and relative) in addition to mouse use. Read-in of existing files in standard file formats (e.g. .dxf or .hpgl) is possible. Technology information is allocated to every drawing element. This makes, for example, different processing speeds and manual tool replacement possible. 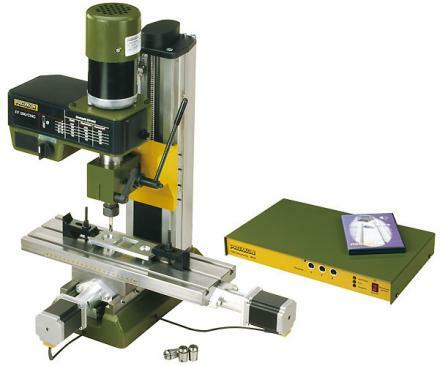 When the workpiece drawing is complete, it is converted into the machine command set (DIN/ISO 66025) by mouse click. Processing can now begin. The command set can also be manually edited or exported. Conversely, the system allows the import or user-writing of datasets. The tool traverse route can be simulated in the graphic window. This allows detection of programming errors. Using cursor keys. These affect the stepped motors directly. The PC software is supplied on a CD-ROM. Installation takes place as usual under Windows®. PC or laptop not included in delivery. Minimum requirements on hardware: Pentium processor with 400 MHz clock rate (or equivalent), high-quality graphic card (64 MB RAM) and at least 40 MB free hard disc space. Selectable by placing drive belt.